Happy First Week of Summer! When not working or trying to stay cool indoors, many of you are about to start living your leisure hours outside this summer. All of the sudden, graduation parties are scheduled, al fresco dinner plans are made, the pool water is right, and your backyard needs to be ready! We need a refresh because the outdoors take a toll on the freshness of furniture and accessories; some cobwebs might need to be brushed off, upholstery washed, and details updated. Today, our What’s New Wednesday will walk you through how we pull together design in our outdoor living spaces to revitalize them for the summer season! Here are our quick tips for refreshing your summer space to make it feel new! Step 1: Decide on Your Overall Look and Feel: Whether that’s casual, chic, bohemian, family friendly, classic, or a mix. Check out an earlier post here about the newest styles in patio decor; how to mix and match updated styles of customizable furniture and upholstery. Outdoor design is a booming sector of our industry. There are so many style and design options to make your space truly one of a kind! Want to update your more traditional space with some geometric accents? We’ve created several potted accents to add a quick refresh to your tabletops, garden stools, and bare corners. We like the thought of mirroring the design of the geometric chandelier (like pictured above) with a centerpiece below it on the coffee table! This clean-lined pencil planter would add a modern touch to any patio in need of a style direction. Step 2: Choose Your Color Palette. Make sure it is seamless with your interior Design since it can be seen from the indoors. Looking for something nautical, adding a pop of bright color, or a Palm Desert vibe? We love this design and the way the shadows play through the white ceramic bowl. Step 3: Plan Your Zones: Seating, Dining, Bar, Storage, etc. 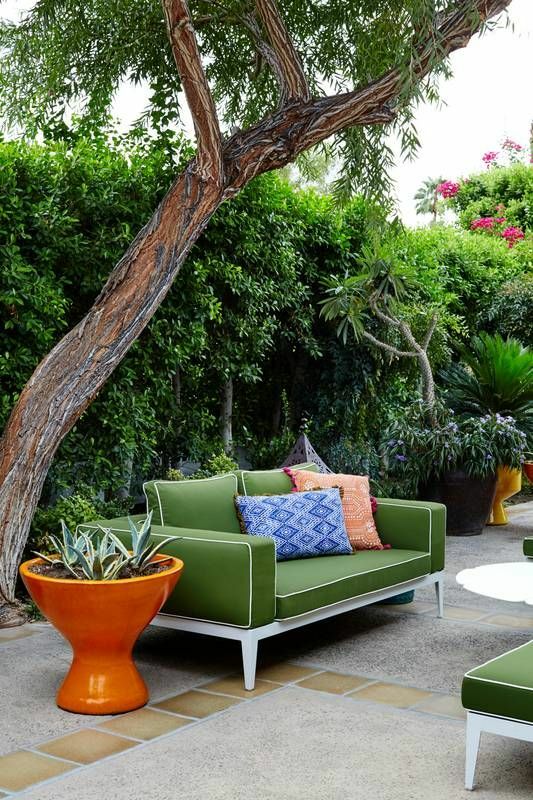 Create zones in your outdoor room using rugs or oversized plants. We love the look of potted trees and grasses. They visually define an are while also keeping it open. Outdoor rugs that are easily washable are our best friend! Photo Credit: Listotic. These three tall potted grasses create an airy wall! This sleek grey pot with grasses is another way to “zone” an outdoor room, while adding color and updated style. The biggest accessory needed outside is potted plants and pops of color from other floral accents. Just like decor and accessories inside, potted permanent florals are the easiest way to frame and accessorize your outdoor living space. It makes your room feel lived in, cozy, and gives it definite personality! Combine matte, polished, and hammered finishes, as well as different colors and tones of pottery. This repeated pattern of smaller greenery designs works well to line down this table. Have you been trying to give your patio that one added touch to up its’ style? Or are you in need of custom plantings or permanent floral arrangements like the ones photographed above? Contact our Dallas interior designers for their expertise in your home or business design or remodel. We would love to meet you!